As with all my patterns, feel free to sell the completed item!! Please do not sell the pattern. 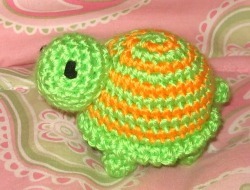 Finished size: 3 inches tall, by 2 ¾ inches wide, by 4 inches long, not including tail. Turtle is worked in one continuous spiral, unless otherwise noted. Now add stuffing and cat ball inside body. Continue stuffing as you go. Use tail to close hole, weave in end. In free loop of row 13, join green with sc in any loop. Ch 1, sc in next sc, repeat around. Join with slp st to first sc made. Slp st to next sc and FO leaving long tail. Stuff and sew head to body. Slp st in 2nd ch from hook, sc in next 2 ch’s, hdc in next ch, dc in last ch. Finished size: 3 ¼ inches tall by 3 inches wide, by 3 inches long, not including legs. Frog is worked in one continuous spiral, unless otherwise noted. Insert cat ball and stuff around it. FO leaving longer tail. Use tail to sew hole shut. 1) 6 sc in 2nd ch from hook. Slp st to first sc made. Sew eye ball to frog eye. 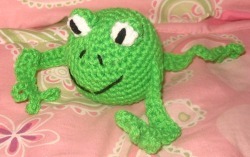 Stuff eye just a bit, and sew to top of frog ball. Ch 8, slp st in first sc of this row, repeat this 2 more times, so you have a total of 3 toes, all with slp st in first sc of this row. Sc in next 4 sc’s, 3 sc in next sc, sc in last 10 sc. Sew arms at frog sides, sew legs at back of frog. Embroider, or paint on eyes. Lady bug is worked in one continuous spiral, unless otherwise noted. Slp st to next sc, Ch 1. 1) 7 sc in 2nd ch from hook. Figure out where you would like the antennas to be. Cut a piece of yarn about 12 inches long. Fold yarn in half. Using your hook, draw up the middle of the yarn piece, around the stitch where you want one of the antennas. Now, chain an additional 4 chains, using both yarn ends. You are now going to have a thicker chain for your antenna. Tie a few knots at the top of the antenna. Snip yarn ends close.